grandma's cookie jar: crafting with grandma - DIY Wood Pictures!!! Be prepared to be amazed . . . and very happy! I am!!! As I browsed on Pinterest this morning, I found something which has to be one of the best "pins" I've ever found! 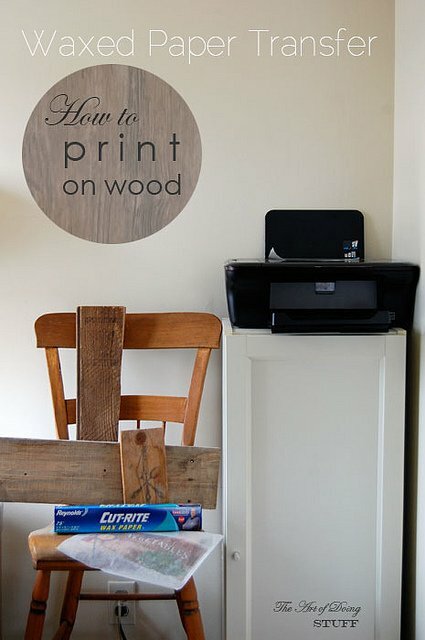 Step-by-step directions for making your own wood photos or pictures!!! And, get ready for more amazement and happiness . . . . all you need are wax paper (which you probably already have in your kitchen! ), a printer (which you probably already have!) and photos or pictures (which you also have!!!) and wood - which you will need to get. Follow this link and you will find complete, step-by-step directions along with a photo tutorial for transferring photos or drawings or pictures to any light, unfinished piece of wood. I am already thinking about the family photos and photos of the boys I could transfer to wood and drawings of the boys which would be great transferred to wood and I'm sure I'll find more great things to use this simple technique with as well! It would be simple to have your grandchildren make their own artwork which you could use this process to help them create a unique and wonderful gift for their Mom and/or Dad for Mother's Day or Father's Day . . . and of course photos of them would be great for this, too! So, what do you think? Is this a project you might try?